Kumara Chinese Reserve Update – Work has started on site & a $5000 donation! 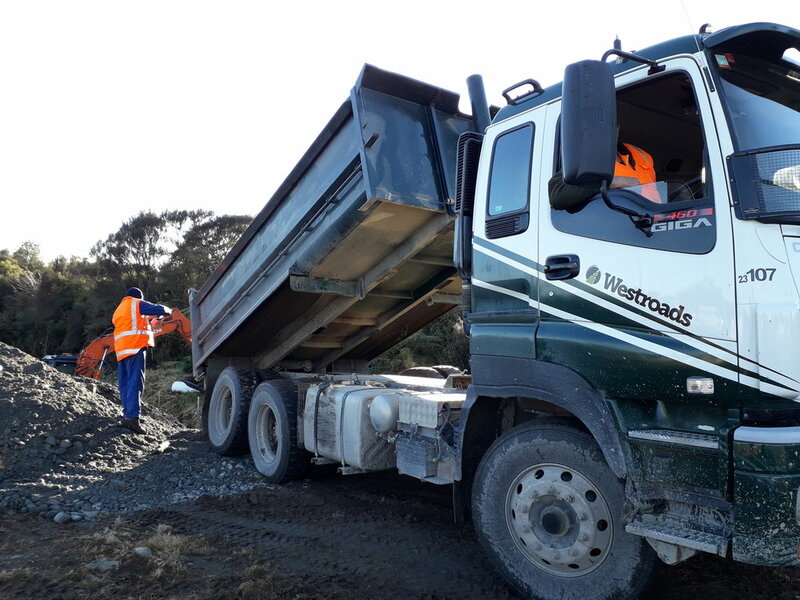 In a major milestone for the Kumara Chinese Reserve, the first contract has been awarded to Westroads (Greymouth). Civil works to do the ground excavation and fill, as well as formation of the contours of the garden has commenced and is expected to be completed mid June 2018. After all our hard work with planning, design work and fundraising, it is exciting to reach this milestone together with our partners and see work finally commencing on the ground. By the end of the contract, we will be able to walk around the reserve and see the actual garden shape, paths, garden zones etc which will finally make the reserve a reality. In another boost to the project, it is exciting and we are grateful to have received a significant donation of $5000 from a local family to be used to fund a table and chair set. There have now been several local families who have donated either land or funds for this project, which shows the local connection with the project. There are other opportunities for local families or groups to donate to the project for either specific items, or just generally for the construction of the garden. The Westland District Council is applying to the Government Tourism Infrastructure Fund (TIF), and it’s time to gather the community support for the “Kumara Application Package”. Click here to see presentation. 20th April 2018 - Closing date for feedback – email to krtreasurer@gmail.com or return flyer to the Kumara Hall mailbox. The Wellington event was hosted by the NZ Chinese History & Cultural Assn (NZCHCA) for our Chinese Reserve project. It was a very successful event and we are both humbled and encouraged by the event. It was well attended (180+), with VIP's including Deputy PM Paula Bennett, Speaker of the House David Carter, other MP's including Maureen Pugh, Chinese VIP's including representatives of the Chinese Embassy and NZCHCA Chairman Steven Wong and our Mayor Bruce Smith. Our project was represented by Chair KRT Julie Rowe, Fiona Pollard Project Manager, Erin Diao (Chris Glasson landscape Architect) and Mike Keenan as our Community Development Officer who is supporting and helping us to develop the key relationships locally & within Chinese community. The event has raised the profile of our project, it is definitely of national interest, not just local. It is acknowledged within the Chinese community as being very special and significant project. This is our 2nd fundraiser with the NZCHCA and it is strengthen our working relationship and partnership with this Association. We are waiting for confirmation about how much the evening raised and our next fundraiser will be in Christchurch in Spring. KRT presented to Westland District Council at their meeting of 29 September, with the outcome of the Council resolving to allocate $150k for the Chinese Miners Memorial Reserve project from the Kumara Endowment Fund. We are happy with the result as it confirms the Council's support and allows us to maintain our momentum with this project. The next Kumara Residents' Trust general meeting will be at 7.30pm on Thursday 15th September at the Theatre Royal (in Hector's Room). As always, everyone is welcome so please do invite anyone you know who's keen to get involved. We are updating our Strategy Document as our current one is outdated- we've accomplished heaps since the last one! Please come along to a meeting at 7.30pm on Thursday 2nd June at the Theatre Royal to give your feedback and expertise in helping to make our new Strategy Document rock. Please contact Julie julesmtns@yahoo.com for a draft copy of the strategy document. The Kumara Autumn Hooley Programme! The days are getting shorter, the nights are getting longer... let's dance and be merry!